Well since I’m on a coconut theme lately, let’s keep it going with some refreshing, healthy, candida fighting Coconut Popsicles! Vitamin Rich: coconut milk contains an abundance of vitamins C, E and B which boost your immune system and contribute to glowing, elastic, healthy skin! Coconut oil is a great way to keep your skin healthy, especially with the extra sun exposure we get in the summer time. Full of good for you fats, fiber, vitamins, minerals and anti-oxidants, coconut milk, meat and oil are all excellent additions to your healthy diet and skin care routine. And these popsicles are a delicious way to get those health benefits! 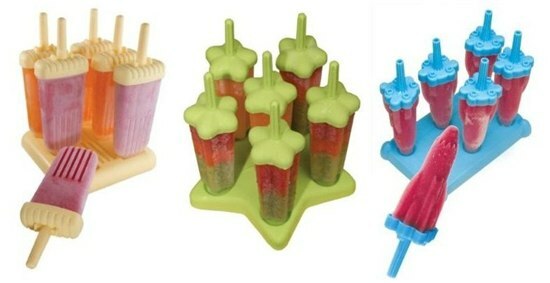 This one is super easy, all you need is a Popsicle mold, like the ones in this post. Once you have your popsicle mold, figure out how much mix it will hold, mine has 4 molds and will hold a shy 1/3 cup in each so I make up about 1 1/4 cup of mix. I use canned coconut milk as the base or use my previous post and make your own! Then I add a few drops of stevia, some vanilla extract and about 1 Tablespoon dutch cocoa powder. Whisk to combine, pour into the molds and wait! I have also combined coconut milk with cardamom, cinnamon, nutmeg and vanilla with a touch of stevia for a chai flavor. Awesome! Coconut milk with lime juice is also yummy. How about fresh mint with or without dutch cocoa powder for a refreshing treat? And, for a cool pick-me-up try mixing some espresso (powder will work too) into the coconut milk with stevia and your favorite extract: vanilla, almond, coconut…?! I’m sure you can come up with more Candida diet friendly frozen treats using flavorful, healthy coconut milk as the base. Stay cool and enjoy! 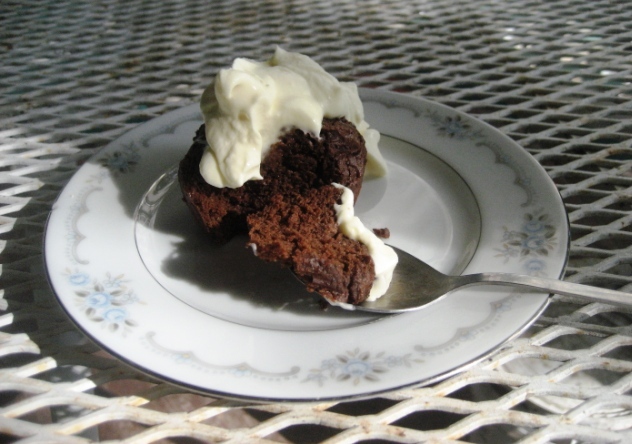 This recipe will make 20 cup cakes or one decadent birthday cake. 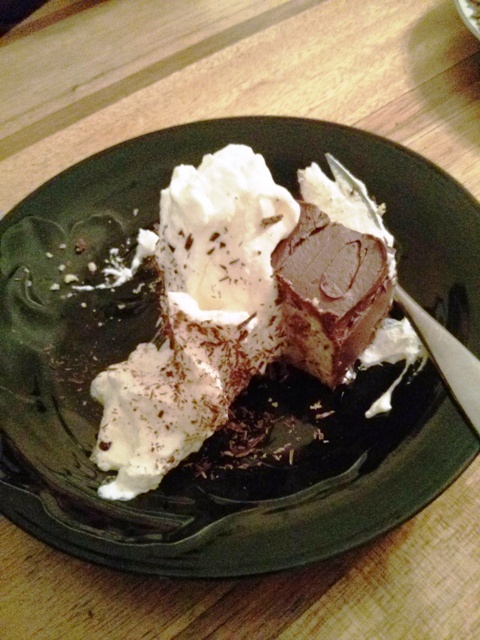 This Father’s day I wanted to make my dad a dessert that would be both decadent and diabetic friendly. 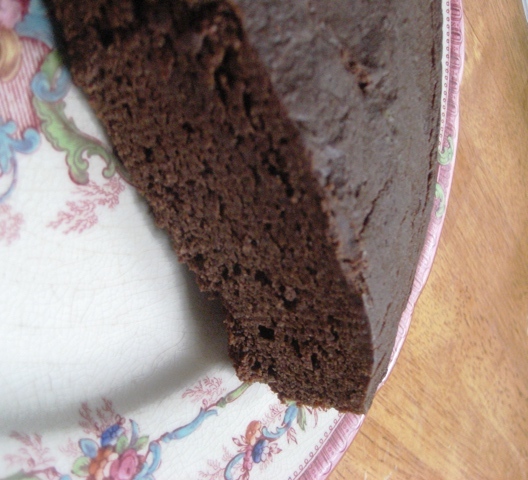 I was aiming for brownies by combining some ideas from a bunch of recipes I found on line and instead I accidentally made this moist and springy chocolate cake. I love when that happens! To sweeten the cake I used a few tablespoons of raw honey (we usually have some left over from making Fire Cider) and then rounded out the sweetness with a small amount of stevia. I find that using a little bit of a flavorful sweetener like wildflower honey or molasses in combination with stevia takes the bitter edge off the plant based sweetener without adding loads of sugar to the recipe. 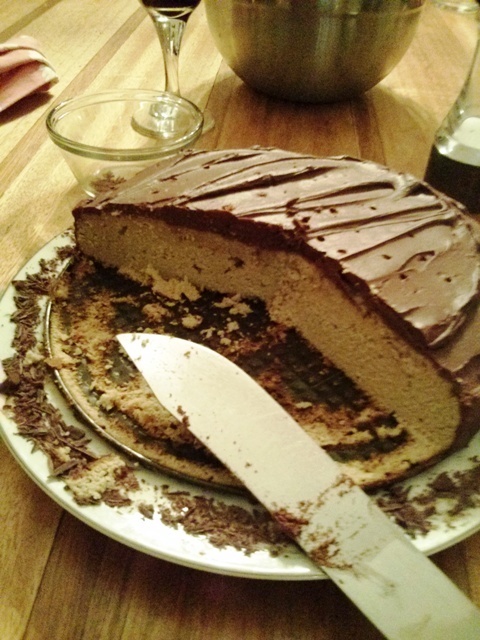 We ate our cake, yes, it’s also gluten free, with whipped cream from the Jersey cows at Highlawn Farm in Lee. The last piece of cake, great even without the whipped cream! 3 Tablespoons honey plus stevia to taste- add a little at a time and taste test in between. If you added the liquor, which is quite sweet, use only 1 Tablespoon of honey. 6 eggs- I get huge farm eggs that are over 1/4 cup each so make sure your eggs measure at least 1 and a 1/2 cups all together. Whisk all the wet ingredients into a smooth batter. 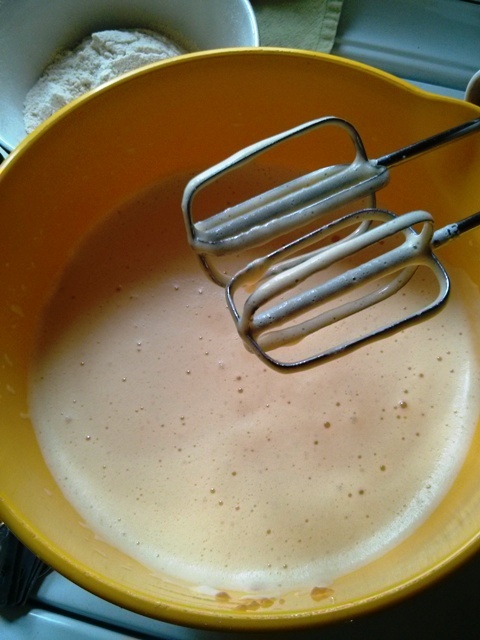 Add the dry ingredients to the batter in several stages, stirring well to combine in between. 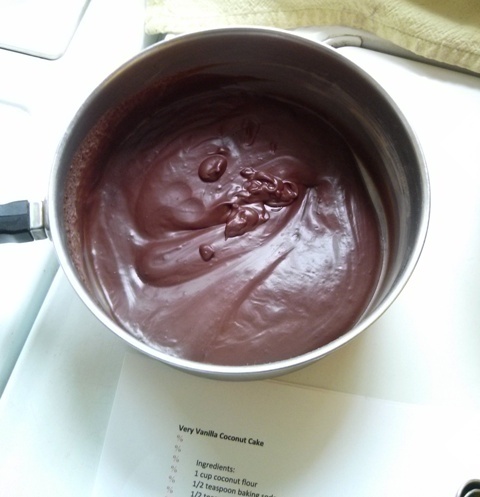 The batter will be like thick brownie batter. 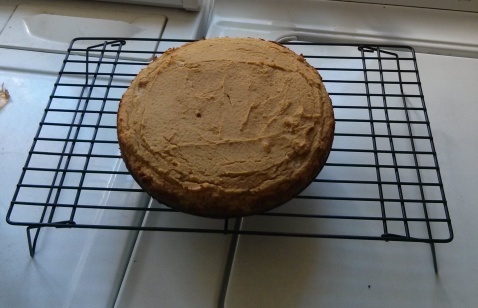 Bake at 350 for 22 minutes (or until just set in the center) in a well greased 8×8 pan. 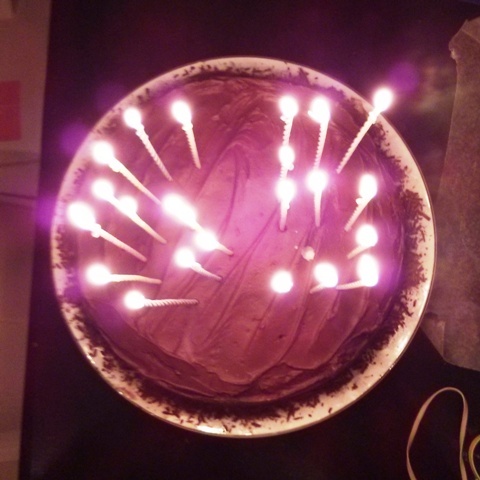 Be careful not to over bake, a knife inserted into the center should come out clean so check the cake after 20 minutes. It should be springy, moist and really rather decadent with a dollop of freshly whipped cream and maybe some sliced ripe strawberries! 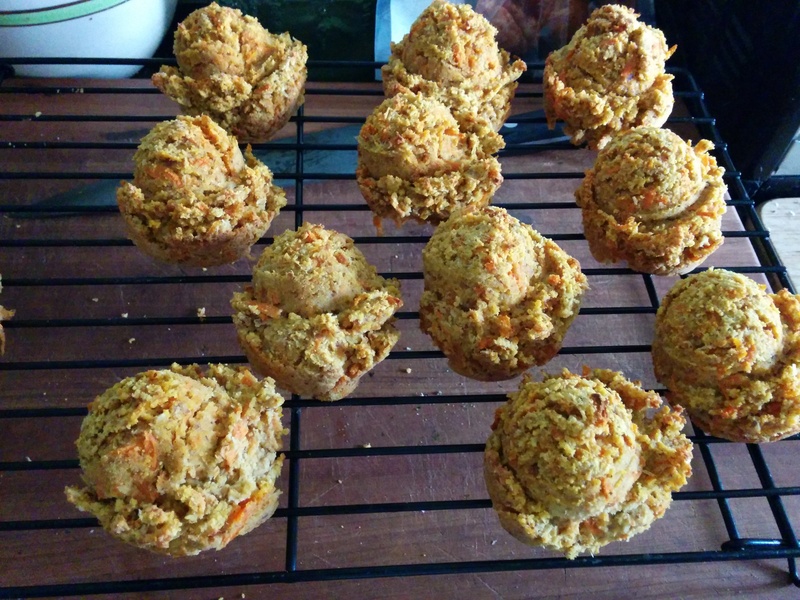 A half recipe will make 10 cupcakes, bake them at 350 for 16 minutes, until just done.